This is a short post which will demonstrate the upgrade process of Veeam Backup and Replication 9.5 U3 to U3a. The U3a was released a week ago and also directly integrated to the Full 9.5 U3a ISO, but for the upgrade, you’ll only need the “veeam_backup_9.5.0.1922.update3a_setup.exe” which is a separate download, once logged in at Veeam. Let’s move on and have a look at Veeam Backup and Replication 9.5U3a Upgrade. The process is pretty straightforward, and will basically make a backup copy first, then installs the U3a and upgrade the whole server to the latest release. And then, after the first launch, the PowerNFS will be upgraded as well. During the upgrade process which in reality took my only about 5-10 min in the lab, you’ll have to make sure to follow the Veeam’s requirements. It can get more complex and much longer if your external SQL server is 2005 (you must upgrade to at least SQL 2008) and/or if you also using VeeamONE (you must upgrade VeeamONE first). 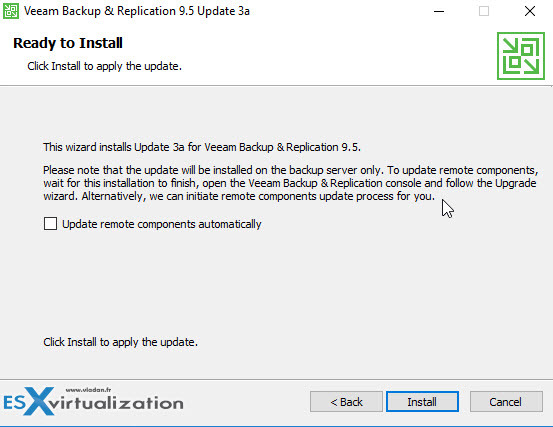 Veeam Backup and Replication 9.5 Update 3a bring a support for VMware vSphere 6.7. It is an important update to install before you’ll upgrade your vSphere to the latest 6.7 release. It also has a vSphere 6.5 U2 support for those who updated their vSphere 6.5 to U2. Are you using Veeam ONE to monitor your backup infrastructure? If yes, upgrade it first. Veeam ONE supports monitoring of backup servers versions 9.5, 9.0 and 8.0. 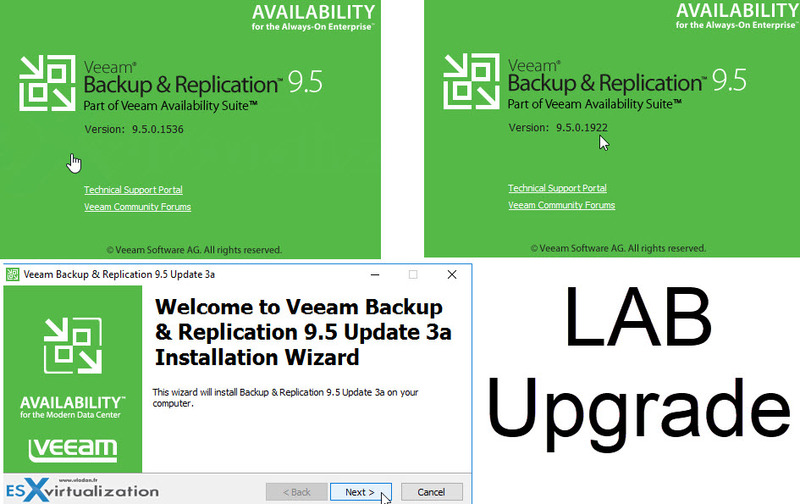 Are you running Veeam Backup & Replication 9.0 (any update) or 8.0 Update #3? If yes, perform the upgrade procedure described below. To upgrade from other versions, contact Veeam Technical Support. Check if the backup server you plan to upgrade is installed on the supported operating system. If not, you must migrate the server to the supported OS first, before performing the upgrade. Refer to the Veeam support KB article KB1803 for more information on how to perform the migration. Check if your Veeam Backup & Replication or Veeam Backup Enterprise Manager configuration database is hosted on Microsoft SQL Server 2005. If yes, you must upgrade the Microsoft SQL Server to version 2008 or later first. We recommend Microsoft SQL Server 2014 or later for performance considerations. Are you using Cloud Connect? If yes, check with your Cloud Connect service provider if they have already upgraded their system to at least the version you are upgrading to. Make sure there is no active processes, such as any running jobs and restore sessions. We recommend that you do not stop running jobs and let them complete successfully. Disable any periodic and backup copy jobs, so that they do not start during the upgrade. Perform a backup of the corresponding SQL Server configuration databases used by backup and Enterprise Manager servers, so that you can easily go back to the previous version in case of issues with upgrade. Note that the built-in configuration backup functionality does not protect Enterprise Manager configuration. Let’s have a look at some screenshots from the upgrade process. Note: You cannot use the Full ISO for upgrade. Only for Clean installs. Step 1: Download the veeam_backup_9.5.0.1922.update3a_setup.exe file. (in fact, it’s a ZIP at Veeam.com, which you’ll unzip to get the EXE). Step 2: Launch and follow the wizard… If you have remote components (proxies) within your environment, they can be upgraded automatically). Backup proxy takes care of the data traffic between VMware vSphere and Veeam Backup and replication during backup, replication, copy or migration jobs. The Veeam proxy is used also during restores. A backup proxy can be installed on a physical server or within a virtual machine. Tip: What is Veeam Proxy? 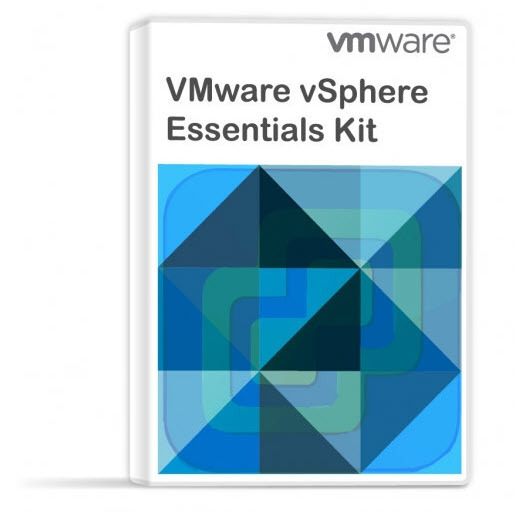 VMware vSphere 6.7 support. Includes the new HTML5 version of vSphere Web Client plug-in for Veeam Backup & Replication, and asynchronous NBD/NBDSSL support for improved read performance of network transport mode with ESXi 6.7. VMware vSphere 6.5 U2 preliminary support. This update addresses all outstanding U2-specific compatibility issues that can be managed from the Veeam side. However, there is a major regression in ESXi 6.5 U2 code that makes the vSphere API fail randomly during high host CPU load periods, consequently impacting a variety of Veeam Backup & Replication functionality. VMware is currently troubleshooting this bug, and fixing one will most likely require the new ESXi 6.5 U2 build issued. VMware vCloud Director 9.1. Update 3a provides compatibility for existing vCloud Director support functionality. VMware Cloud on AWS version 1.3 support and preliminary out-of-the-box compatibility with future VMC updates through the removal of the API version match requirement. Microsoft Windows 10 April 2018 Update. Includes support as guest virtual machines and for installation of Veeam Backup & Replication and all of its components. Microsoft Windows Server 1803. Update 3a provides Windows Server 1803 support as guest virtual machines, for installation of Veeam Backup & Replication remote components, and as a domain controller for Veeam Explorer™ for Microsoft Active Directory. Microsoft Windows Server Hyper-V 1803. Update 3a provides Hyper-V 1803 support as a hypervisor host, including support for processing VMs with virtual hardware version 8.3. Microsoft System Center Virtual Machine Manager 1801 support. Performance of Direct Storage Access (DirectSAN) and Virtual Appliance (Hot Add) transport modes has been improved for backup infrastructure configurations through optimizing system memory interaction. Added support for Direct Restore to Microsoft Azure for environments with ExpressRoute or site-to-site VPN connectivity to Azure, in which case proxy and helper appliances may have private IP addresses only. To enable, create AzurePreferPrivateIpAddressesForProxyandLinuxAppliance (DWORD, 1) registry value under HKLM\SOFTWARE\Veeam\Veeam Backup and Replication key on the backup server. This is it for today. Happy upgrades.